Me, in 2013: "Is Hasbro really expecting to reuse this body in the future? Who for? How many seven-foot-tall women are there in the Marvel Universe?" Hasbro, in 2015: "At least two more, dumb-dumb!" With the unbreakable Dragonfang sword and a heavy steel chain, these heroines bring evil to its knees. Wait, "heroines"? Isn't Thundra a villain? She was created by Roy Thomas, who you'll remember was also behind Valkyrie's eye-rolling origin. His issues really came to the forefront with Thundra, who comes from a potential future where female overlords have enslaved the male population, the US has been renamed the United Sisterhood Republic, and Earth is known as "Femizonia." Seriously, looking back at old people's fears about feminism is as stupid as looking back at their fears about Communism. At least Thundra's co-creator, Gerry Conway, helped offset this idiocy by also introducing the parallel reality where Femizonia is "Machus" and the ruler is named "Mahkizmo." Anyway, Thundra came back to the present in order to prove female superiority once and for all by defeating the strongest male of all time: the Thing. 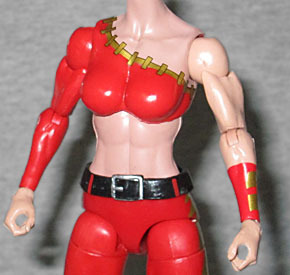 So of course she'd have to be big and strong, which is why this toy is based on the Red She-Hulk body. 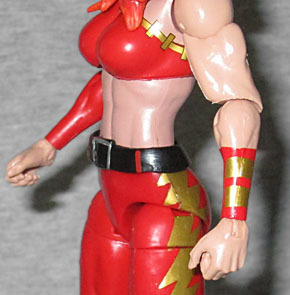 It's not a straight repaint: the forearms and chest are new - if you remember, Reddy has sculpted costume elements in both those areas, while Thundra is 100% smooth. Even the golden upper edge of her shirt - which is supposed to be a metal band of some sort - is simply painted on. She does get a free-floating belt, to at least break up the shapes a little. A lot of companies give their female figures very plain, neutral expressions, because it's hard to make something pretty and expressive at the same time. Thundra, on the other hand, is actually showing some emotion! Her brow is knit, and her mouth is open in a snarl. This woman is angry, and she's ready to take that out on somebody. Thundra has bright orange hair, but there's a little bit of paint spill between that and her silver tiara. The edge of her shirt and the lightning bolts on her legs are painted gold, while her boots are merely molded in that color - so the colors don't quite match. At least they didn't try to mix gold and yellow, right? The white of her teeth and the red of her lipstick are done well, with no obvious mistakes there. Her belt is painted with red stripes to suggest belt loops (something that comic art often forgets characters need). She has joints at the head, shoulders, biceps, elbows, wrists, torso, hips, thighs, knees, and ankles. The biceps and the elbows both provide the same range of motion, so it's weird that they'd do both. Like the bio suggested, she's armed with her signature weapon: a weighted chain. Yeah, it's not very exotic, but it works for her. She usually wears it wrapped around her forearm, but this version has a small handle she can hold. 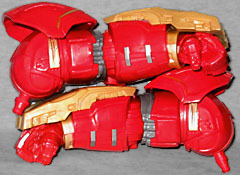 Both Fearless Defenders come with an arm for the Hulkbuster BAF - Valkyrie has the right arm, and Thundra has the left. So yes, to complete the full figure, you'll need to buy them both. When Red She-Hulk came out in Series 4, she was supposed to have a variant - that variant would have been Lyra, the daughter of Thundra and the Hulk. That "Savage She-Hulk" remains unreleased, so it's surprising Hasbro didn't choose to release her here, the way they brought out some previously missing figures in Series 6. But honestly, Thundra is more memorable than Lyra, so we're glad this is the direction they went.